Retinopathy of prematurity (ROP) affects approximately 60-70% of infants born at less than 32 weeks’ gestational age or less than 1500g birth weight. 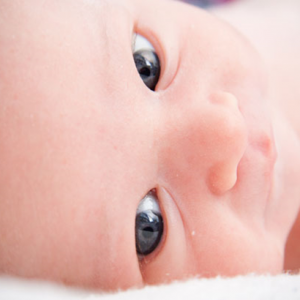 ROP occurs when a baby is born too early to have reached an important milestone in the development of their eyes. To function properly, the retina needs a constant supply of blood to provide oxygen. The blood vessels that supply this blood usually develop between weeks 16 and 36 of pregnancy. From 16 weeks’ gestation the blood vessels grow gradually toward the edges of the retina, supplying oxygen and nutrients. During the last 12 weeks of a pregnancy, the eye develops rapidly. When a baby is born full-term, the retinal blood vessel growth is mostly complete (the retina usually finishes growing a few weeks to a month after birth). But if a baby is born prematurely, before these blood vessels have reached the edges of the retina, normal vessel growth may stop and the edges of the retina may not get enough oxygen and nutrients therefore developing ROP. On the NICU there is a designated ROP team who run weekly clinics to assist screening and treatment for ROP. Depending on the severity of the ROP your baby will be screened either weekly or fortnightly. If your baby qualifies for ROP screening the week before your baby’s screen is due, you will receive an information booklet about the condition and the different severities of ROP. The ROP nurse will be happy to discuss any questions you have once you have been given this booklet.